A stay at H15 Boutique Hotel places you in the heart of Warsaw, within a 15-minute walk of Palace of Culture and Science and Warsaw University of Technology. This 5-star hotel is 0.7 mi (1.1 km) from U.S. Embassy and 1.4 mi (2.2 km) from University of Warsaw.Rooms Make yourself at home in one of the 47 individually decorated guestrooms, featuring refrigerators and minibars (stocked with some free items). Wired and wireless Internet access is complimentary, and LCD televisions with cable programming provide entertainment. Bathrooms have complimentary toiletries and hair dryers. Conveniences include phones, as well as safes and desks.Amenities Treat yourself with massages, body treatments, and facials. If you're looking for recreational opportunities, you'll find a fitness center and bicycles to rent. This hotel also features complimentary wireless Internet access, concierge services, and a television in a common area.Dining Enjoy international cuisine at SIGNATURE RESTAURANT, a restaurant which features a bar, or stay in and take advantage of the 24-hour room service. Buffet breakfasts are available daily from 7 AM to 11 AM for a fee.Business, Other Amenities Featured amenities include complimentary wired Internet access, limo/town car service, and express check-in. Guests may use a train station pick-up service for a surcharge, and self parking (subject to charges) is available onsite. A stay at Hotel Gromada Warszawa Centrum places you in the heart of Warsaw, within a 15-minute walk of Palace of Culture and Science and University of Warsaw. This hotel is 1 mi (1.6 km) from Royal Castle and 1.1 mi (1.8 km) from Copernicus Science Centre.Rooms Make yourself at home in one of the 313 guestrooms. Your pillowtop bed comes with premium bedding. Complimentary wireless Internet access keeps you connected, and cable programming is available for your entertainment. Private bathrooms with showers feature complimentary toiletries and hair dryers.Amenities Enjoy recreation amenities such as a 24-hour fitness center or take in the view from a garden. This hotel also features complimentary wireless Internet access, concierge services, and gift shops/newsstands.Dining Grab a bite at U Chlopa, one of the hotel's 2 restaurants, or stay in and take advantage of the room service (during limited hours). Snacks are also available at the coffee shop/café. Wrap up your day with a drink at the bar/lounge. Buffet breakfasts are served on weekdays from 6:30 AM to 10:30 AM and on weekends from 6:30 AM to 11:00 AM for a fee.Business, Other Amenities Featured amenities include express check-in, express check-out, and complimentary newspapers in the lobby. This hotel has 5 meeting rooms available for events. Self parking (subject to charges) is available onsite. A stay at Warsaw Marriott Hotel places you in the heart of Warsaw, within a 15-minute walk of Palace of Culture and Science and Warsaw University of Technology. This 5-star hotel is 1.2 mi (1.9 km) from U.S. Embassy and 1.3 mi (2.1 km) from University of Warsaw.Rooms Make yourself at home in one of the 523 air-conditioned rooms featuring minibars and LCD televisions. Wireless Internet access (surcharge) keeps you connected, and satellite programming is available for your entertainment. Private bathrooms with bathtubs feature complimentary toiletries and hair dryers. Conveniences include phones, as well as safes and desks.Amenities Relax at the full-service spa, where you can enjoy massages, body treatments, and facials. After enjoying recreational amenities such as a health club and an indoor pool, a lucky night at the casino is the perfect end to the day. Additional amenities at this hotel include complimentary wireless Internet access, concierge services, and babysitting/childcare (surcharge).Dining Grab a bite to eat at one of the hotel's 2 restaurants, or stay in and take advantage of the 24-hour room service. Snacks are also available at the coffee shop/café. Need to unwind? Take a break with a tasty beverage at one of the 2 bars/lounges. Buffet breakfasts are available daily from 6:30 AM to 11 AM for a fee.Business, Other Amenities Featured amenities include a business center, express check-in, and dry cleaning/laundry services. Planning an event in Warsaw? This hotel has facilities measuring 27986 square feet (2600 square meters), including a conference center. Self parking (subject to charges) is available onsite. Located in Warsaw (Srodmiescie), Polonia Palace Hotel is within a 15-minute walk of Palace of Culture and Science and Warsaw University of Technology. This 4-star hotel is 0.9 mi (1.5 km) from U.S. Embassy and 1.1 mi (1.7 km) from University of Warsaw.Rooms Make yourself at home in one of the 206 air-conditioned rooms featuring minibars and LCD televisions. Complimentary wireless Internet access keeps you connected, and satellite programming is available for your entertainment. Private bathrooms with shower/tub combinations feature designer toiletries and hair dryers. Conveniences include phones, as well as laptop-compatible safes and desks.Amenities Be sure to enjoy recreational amenities including a sauna and a 24-hour fitness center. 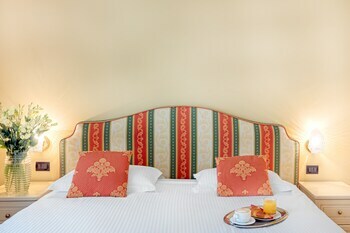 Additional features at this Belle Époque hotel include complimentary wireless Internet access, babysitting/childcare (surcharge), and a hair salon.Dining Enjoy a meal at the restaurant or snacks in the coffee shop/café. The hotel also offers 24-hour room service. Quench your thirst with your favorite drink at the bar/lounge. Buffet breakfasts are served on weekdays from 6:30 AM to 10 AM and on weekends from 6:30 AM to 10:30 AM for a fee.Business, Other Amenities Featured amenities include a 24-hour business center, limo/town car service, and complimentary newspapers in the lobby. A roundtrip airport shuttle is provided for a surcharge (available 24 hours), and self parking (subject to charges) is available onsite. A stay at Mamaison Residence Diana places you in the heart of Warsaw, within a 15-minute walk of Palace of Culture and Science and University of Warsaw. This aparthotel is 1.2 mi (1.9 km) from U.S. Embassy and 1.2 mi (2 km) from Royal Castle.Rooms Make yourself at home in one of the 46 air-conditioned rooms featuring kitchenettes with refrigerators and microwaves. Wired and wireless Internet access is complimentary, and plasma televisions with satellite programming provide entertainment. Conveniences include safes and desks, and housekeeping is provided daily.Amenities Pamper yourself with onsite massages or enjoy recreation amenities such as a fitness center.Dining Enjoy a satisfying meal at Maka i Woda serving guests of Mamaison Residence Diana. Buffet breakfasts are available daily from 7 AM to 10:30 AM for a fee.Business, Other Amenities Featured amenities include complimentary wired Internet access, dry cleaning/laundry services, and a 24-hour front desk. A roundtrip airport shuttle is provided for a surcharge (available 24 hours), and self parking (subject to charges) is available onsite. Located in the centre of Warsaw within just a 7-minute drive from the beautiful Old Town Square Mercure Warszawa Grand offers modern spacious rooms with an LCD TV and free WiFi.All rooms in the Mercure Warszawa Grand are air-conditioned. They all feature a minibar and a tea and coffee maker. Each private bathroom comes with a hairdryer and necessary amenities.The Winestone restaurant offers an international cuisine and a wide selection of wine from around the world. The exquisite dishes are served on stone plates called les planches. Brasserie Restaurant offers morning breakfast. Room service is available.Extra facilities at the hotel include a sauna fitness centre babysitting service and dry cleaning.Mercure Warszawa Grand is situated 1.5 km from the Lazienki Park the National Museum and one of the most popular shopping streets in Warsaw Nowy Swiat. Warszawa Centralna Railway Station is just a 10-minute walk away. Located in Warsaw (Srodmiescie), Metropol Hotel is within a 15-minute walk of Palace of Culture and Science and Warsaw University of Technology. This hotel is 0.9 mi (1.4 km) from U.S. Embassy and 1.2 mi (1.9 km) from University of Warsaw.Rooms Make yourself at home in one of the 211 guestrooms. Complimentary wireless Internet access keeps you connected, and satellite programming is available for your entertainment. Bathrooms have showers and hair dryers. Conveniences include phones, as well as desks and complimentary bottled water.Amenities Make use of convenient amenities, which include complimentary wireless Internet access and concierge services.Dining Enjoy a satisfying meal at Metro Jazz Bar & Bistro serving guests of Metropol Hotel. Wrap up your day with a drink at the bar/lounge. Buffet breakfasts are available daily from 6:30 AM to 10 AM for a fee.Business, Other Amenities Featured amenities include limo/town car service, dry cleaning/laundry services, and a 24-hour front desk. Self parking (subject to charges) is available onsite. A stay at Novotel Warszawa Centrum places you in the heart of Warsaw, within a 15-minute walk of Palace of Culture and Science and U.S. Embassy. This 4-star hotel is 1 mi (1.7 km) from Warsaw University of Technology and 1.1 mi (1.8 km) from University of Warsaw.Rooms Make yourself at home in one of the 742 air-conditioned rooms featuring flat-screen televisions. Complimentary wireless Internet access keeps you connected, and satellite programming is available for your entertainment. Private bathrooms with bathtubs or showers feature complimentary toiletries and hair dryers. Conveniences include phones, as well as laptop-compatible safes and desks.Amenities Be sure to enjoy recreational amenities including a sauna and a fitness center. Additional features at this hotel include complimentary wireless Internet access, concierge services, and gift shops/newsstands.Dining Enjoy international cuisine at NOVO2 Lounge Bar, a restaurant which features a bar, or stay in and take advantage of the 24-hour room service. Buffet breakfasts are available daily from 6:30 AM to 10:30 AM for a fee.Business, Other Amenities Featured amenities include a business center, express check-in, and express check-out. Planning an event in Warsaw? This hotel has facilities measuring 12917 square feet (1200 square meters), including a conference center. A roundtrip airport shuttle is provided for a surcharge (available 24 hours), and self parking (subject to charges) is available onsite. A stay at Hotel Apartments Zgoda Warszawa by DeSilva places you in the heart of Warsaw, within a 15-minute walk of Palace of Culture and Science and University of Warsaw. This hotel is 0.8 mi (1.3 km) from U.S. Embassy and 1.2 mi (1.9 km) from Royal Castle.Rooms Make yourself at home in one of the 51 air-conditioned rooms featuring LCD televisions. Complimentary wireless Internet access keeps you connected, and cable programming is available for your entertainment. Private bathrooms with showers feature complimentary toiletries and hair dryers. Conveniences include phones, as well as coffee/tea makers and complimentary bottled water.Amenities Make use of convenient amenities, which include complimentary wireless Internet access and tour/ticket assistance.Dining Wrap up your day with a drink at the bar/lounge. Buffet breakfasts are available daily from 7 AM to 10 AM for a fee.Business, Other Amenities Featured amenities include a computer station, complimentary newspapers in the lobby, and dry cleaning/laundry services. Planning an event in Warsaw? This hotel has facilities measuring 387 square feet (36 square meters), including a meeting room. Self parking (subject to charges) is available onsite. With a stay at Residence St. Andrew's Palace, you'll be centrally located in Warsaw, a 5-minute drive from U.S. Embassy and 5 minutes from Palace of Culture and Science. This 4-star hotel is 0.7 mi (1.2 km) from University of Warsaw and 1.3 mi (2 km) from Royal Castle.Rooms Make yourself at home in one of the 24 guestrooms featuring refrigerators. Complimentary wired and wireless Internet access keeps you connected, and satellite programming provides entertainment. Bathrooms have complimentary toiletries and bidets. Conveniences include phones, as well as safes and complimentary bottled water.Amenities Make use of convenient amenities such as complimentary wireless Internet access, babysitting/childcare (surcharge), and shopping on site.Dining Enjoy a meal at the restaurant or snacks in the coffee shop/café. The hotel also offers room service (during limited hours). Buffet breakfasts are available daily from 7 AM to 11 AM for a fee.Business, Other Amenities Featured amenities include complimentary wired Internet access, dry cleaning/laundry services, and multilingual staff.